Please call 724-547-6203 for pricing on banners, direct email blasts, job integration, front page links, or customized marketing packages. We accept all major credit cards, Visa, MasterCard, American Express and Discover. Join over 5,000 aviation companies that advertise on JSfirm.com. It is a cost effective solution for filling your open aviation positions. With over 485,000 users and more than 11 million hits a month, JSfirm.com is the obvious place to advertise your aviation jobs and access over 200,000 aviation resumes. Over a decade of creating strong partnerships ensures that JSfirm.com will save you time and money. 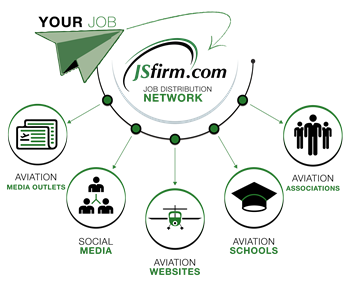 By posting your job with JSfirm.com it is instantly distributed through our Job Distribution Network (JDN). In addition to utilizing social / professional networking sites and job aggregation websites, we have created partnerships with industry specific sites in an effort to maintain the largest JDN for the aviation industry. We reach both active and passive job seekers by distributing job postings to aviation and aerospace media partners. It‘s simple, post your job ads on JSfirm.com and let our JDN do the rest. Call 724-547-6203 or Post A Job Here On Line! Avionics, A&P Mechanics, Structural Technicians, Interior Fabrication, Pilot Services, General Labor, Executives, Aviation Managers, Sales, Aerospace Engineering, and More.